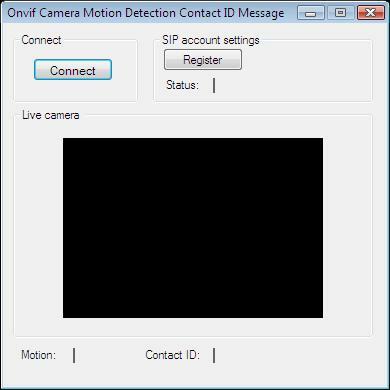 This example demonstrates how you can connect your Windows Forms or WPF Application written in C# to an IP camera with motion detector. On this webpage you can also find more information on how to register your program to a PBX and send a Contact ID message to an alarm monitoring center. To implement this example, you need to have OZEKI Camera SDK installed, and a reference to OzekiSDK.dll should be added to your Visual Studio project. How to handle alarms, by sending a Contact ID message to an alarm monitoring center using C#? You should also visit the How to setup viewer side motion detection and the previous How to handle alarms, by making a VoIP phone call to an alarm monitoring center with text to speech article before you begin to study this function. You can find a detailed guide about the Contact ID protocol at the Contact ID protocol page. The official documentation of the Contact ID protocol can also be found here: Contact ID standards. It is also necessary to create a ContactIdHandler type object that needs to subscribe to the ContactIdSendFailed and ContactIdSendSuccessful events. When the ContactIdSendFailed event occurs, it means that the sending of the alarm (that is the contact ID) is failed. For instance, the kissoff signal is not received. When the ContactIdSendSuccessful event occurs, it means that the sending of the alarm has been successful. In this event the call will be hung up. This example program will send DTMF Contact ID sequences according to their function: account number, event qualifier, event code, partition number, zone number. If you wish to receive Contact ID messages, please study the tutorial that describes. how to receive a Contact ID alert in C#. After the successful implementation of the functions and the GUI elements, the application will work properly. Pressing the connect button will load in the image of the IP camera device connected to your PC into the panel that you can see on the picture. By pressing the Register button you can register the SIP account to a PBX. If the registration was successful and motion was detected, the program sends a Contact ID message to an alarm monitoring center. It will be indicated in label's text. My alarm monitoring center did not get the Contact ID message. Why?